Proponents of laws like Hansell's say the legislation not only provides free meals for those who may want them, but also helps clear the roads of large animals in rural areas where clean-up crews are sparse and contributes to the research of migration, health and disease patterns of wild animals. Opponents, however, have warned of the risks of diseased meat and worry that legalization efforts could lead to over-eager drivers striking down animals just to get a free steak. Despite those concerns, many state legislators are hungry to allow drivers to take fresh meat off a car grille and put it on a charcoal grill. Under the law that Hansell, a Republican representing a largely rural district in northeastern Oregon, wrote — it unanimously passed both Oregon state chambers last year and became effective on Jan 1. 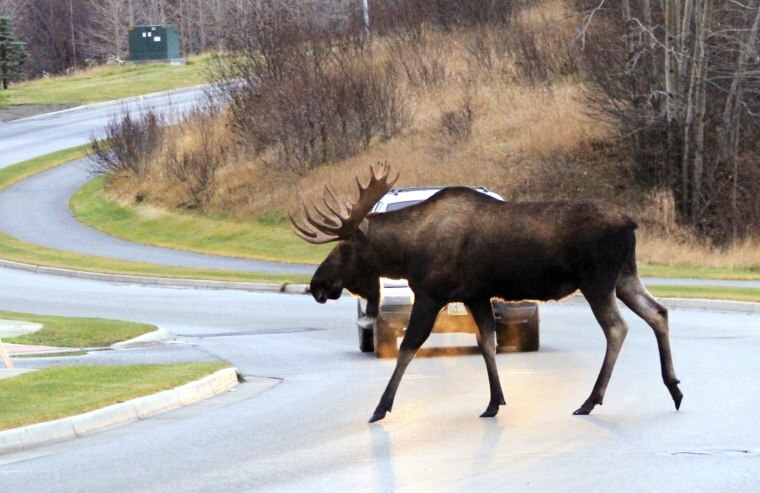 — drivers can take home the carcasses of deer or elk they, or others, have accidentally struck and killed while driving. Interested drivers must get a permit (it's free and can be obtained via a mobile app within 24 hours of the accident), under which they agree to properly dispose of the unused parts of the animal, consume the meat at their own risk and provide the location of the accident. Drivers are also required to submit, within five days, the head and antlers of the dead animal to their local Oregon Department of Fish and Wildlife office for research purposes. Since the law took effect, more than 200 animals have been salvaged, Hansell said, noting that some fans of the new legislation have dubbed it the "meals-under-wheels" law. Hansell modeled his bill closely after one passed in Washington State in 2016. Idaho legalized the practice in 2012, Tennessee dealt with the issue 20 years ago and, according to food blog Wide Open Eats, which has tracked such legislation, a total of 27 states have passed laws legalizing the consumption of animals killed by vehicles. California state Sen. Bob Archuleta, a Democrat who represents a Los Angeles district, has proposed a bill nearly identical to Hansell's. "All of this done together will lead to safer roadways and more data for...state agencies to identify where roadway defenses can be enhanced and future wildlife highway overcrossings can be identified," a spokesman for Archuleta said. In Wyoming, lawmakers introduced similar legislation in 2015 and 2017 but the bills failed to advance both times, due to strong opposition from the state's Game and Fish Department. "What we find is that animals that become roadkill have a higher prevalence of diseases," Wyoming Game and Fish Department spokeswoman Rebekah Fitzgerald said, pointing to Chronic Wasting Disease in deer and Brucellosis in elk. "We want to ensure that people are eating edible and healthy meat." Chronic Wasting Disease is not transmittable to humans, but Brucellosis is. It can cause profuse sweating and joint and muscle pain. Wyoming officials also have expressed concerns over the possibility that laws like the one passed in Oregon could incentivize drivers to intentionally strike wild game with their cars — a worry shared by animal welfare organizations such as the Humane Society of the United States. "Our concern really is where people might intentionally hit animals for trophy or food. Like an elk or something large. It's incredible dangerous. For both species," John Griffin, the senior director of urban wildlife programs at the Humane Society of the United States, told NBC News. Other animal advocates, however, said eating roadkill is the most harmless way to consume meat. "While the best thing for animals, the environment and human health is to go vegan," People for the Ethical Treatment of Animals (PETA) spokeswoman Sophia Charchuk said, "roadkill is certainly a superior option to the neatly shrink-wrapped packages of meat in the supermarket."